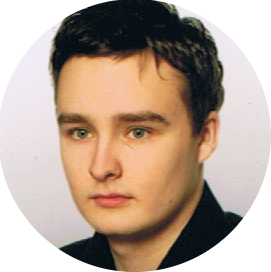 My name is Krystian Dużyński and I'm 27 years old. I live in Kraków in Poland where I finished Applied Science on University of Science and Technology. My programming experience started when I was 12 years old and since then, I spend almost all the time on developing my skills. I started my programming experience with Macromedia Flash (currently Adobe Flash) and HTML. I spent lot of the time creating simple games and tools in these technologies. After Flash - C++ and Visual Basic came into play. The last one allowed me to create GUI applications easily, while C++ taught me various aspects of low-level internals of the computers. Some time later, I discovered OpenGL which helped me to understand how 3D games are made. In the meantime, I was learning PHP and other web-related technologies. The significant turn in my life was when I found C#.NET. With this technology I was able to create small, as well as big and complex applications. Together with C#.NET I was learning DirectX. I spent lot of time on creating 3D applications, games, engines and frameworks. During my studies, I learned lot of electronics, designing electronic circuits and microcontrollers programming. Nowadays, I successfully deal with connecting various systems using different technologies and programming languages. In 2016 I set up a company offering software development services. During my live I have dealt with lot of totally different things and done plenty of jobs. Today I am never limited to one technology, I always choose the right one to solve specific problems, never other way round.